This easy, all-in-one casserole makes a warming supper dish. Preheat the oven to 180°C, gas mark 4. Heat half the oil in a 2-litre ovenproof casserole. Add the parsnips and shallots and cook for 5 minutes until golden. Transfer to a plate. Heat the remaining oil in the pan. 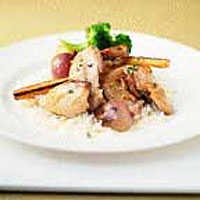 Cut each chicken thigh into three and cook in three batches for 3-5 minutes each until golden brown. Return all the chicken to the pan with the wine and stock. Bring to the boil and season. Add the parsnips and shallots, cover and cook in the oven for 25-30 minutes until the chicken is thoroughly cooked. Meanwhile, cook the rice according to the pack instructions. Steam the broccoli for 8-10 minutes until tender. Remove the casserole from the oven, sprinkle with marjoram and serve with rice and broccoli.